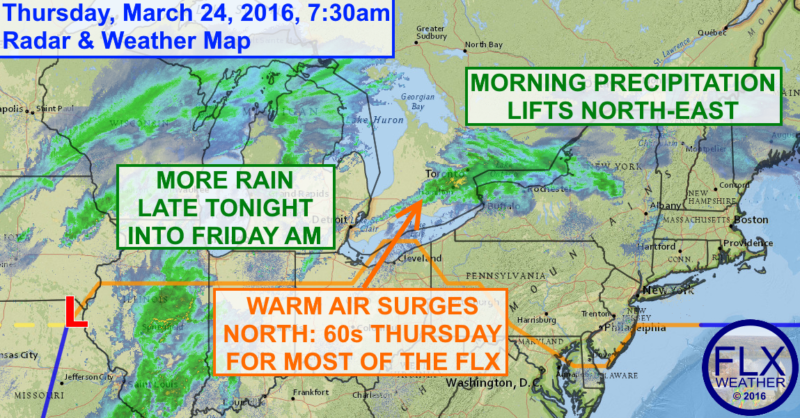 Morning precipitation will lift north today, allowing for warmer air to flood in from the southwest. The frontal boundary that was over the region yesterday sank south last night, but should race back north today. Precipitation ahead of the front is mostly north of the Finger Lakes, but some wintry precipitation remains in the Rochester area. This precipitation will lift north and east out of the Finger Lakes and the region should remain dry the remainder of the daytime hours today. Caught up in the southerly winds ahead of low pressure making its way into the Great Lakes, a pocket of warm air will surge north and east into the Finger Lakes. While 7am temperatures were in the low 30s in Buffalo and Rochester, it was 60 degrees in Cleveland. This 60 degree warmth should make it into the majority of the Finger Lakes by this afternoon. The far northwestern areas near Rochester may miss out on the warmth though, with highs there closer to the 40s and 50s. Low and mid 60s should be commonplace across the rest of the region. The cold front associated with this storm will approach the area tonight. A few showers will be possible this evening, but the bulk of the rain should fall after midnight and into early Friday morning. Temperatures will drop into the 50s tonight, but will then continue to fall into the 40s during the day on Friday. Some sun may come out by late in the day Friday. The weekend is looking great, though. Saturday and Sunday should both have a good deal of sunshine. Temperatures will be pleasant on Saturday with highs in the 50s. Sunday will be spectacular though, with highs returning to the mid 60s. A new storm system moves in on Monday with rain, wind and maybe some thunder. This will kick off an unsettled, cool week next week.